Oddly enough, I’ve been meaning to put this up for over a week. Originally, I was going to wait until I had the book ready for sale, but you know, reality has it’s own agenda. All of a sudden, a bunch of things suddenly erupted onto my schedule like post-rain mushrooms. Given that Smashwords takes a bit of time to publish things, I thought I’d put the teaser up now. It’s my second book, and this one is in the spirit of Poul Anderson’s Time Patrol. The title is The Ghosts of Deep Time, and the book contains a novel and a short story. “A consultant finds a fossilized pack in the desert, then finds himself back in the Miocene with a criminal gang. A game warden busts a group of trespassing druids in a wildlife sanctuary. 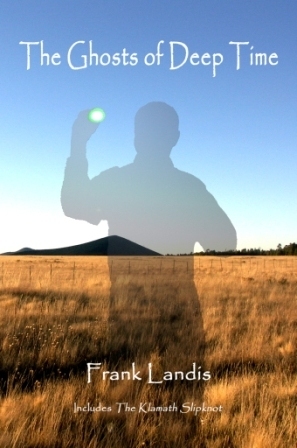 They vanish in a green flash and he loses his job, only to be recruited for something much bigger. This is the big secret: time travel is easy. There are over four billion years in Earth’s past. The deeper one goes in time, the more alien the Earth is. Still, people have settled most of Earth’s history. Of course they live without a trace, for that is the law of deep time. To do otherwise could create paradoxes, bifurcating histories, even time wars and mass extinctions. Here’s a sample. Enjoy! The Smashwords version will be available in a couple of weeks, and a paper version will be available through Lulu late next week. I’ll add links as things progress. A couple of you may have seen this already. If so, feel free to comment on it.